I'm so excited. We have frogs! Well, we have them every summer, but I've only ever heard them, never seen them.this morning, our regular calling male was joined by another frog, replying in the same language of "bonk bonk". When I went to see, this is what I found. A bit later and we had frog eggs! Now, should I move them somewhere where the goldfish can't get them, or will they be all right? May all your weeds be wildflowers - Author unknown. Excellent news... I love to hear of gardens with frogs. Re the goldfish...do you have another pond? Maybe it would be easier to move the fish? 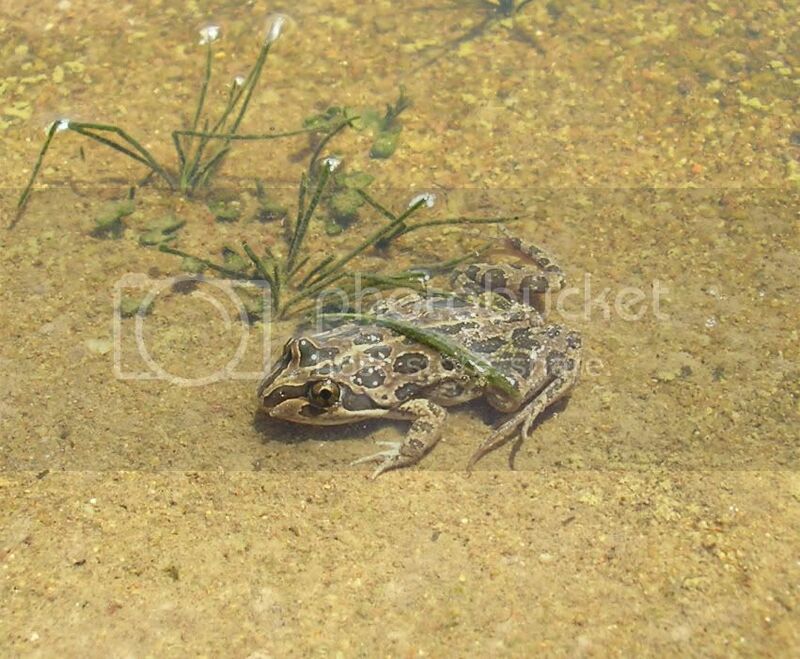 Brilliant photo's and I do like frogs, one of the few beastie's of this world that I don't run from. Thanks, Mr Wisteria and midgin. I don't have another pond, but I do have a large pot with water and irises in it. Was thinking of moving the frogspawn to here. It's not big enoughfor the fish, which are actually koi and about 10cm long. Will they eat the eggs? Well done Chrysanth. I often hear frog calls, which I enjoy very much, but it's very hard to spot the frogs. Your pond must have a really good balanced environment. 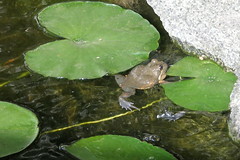 Maybe you should think about making a second pond with frog friendly fish. Now that they've started breeding this problem will keep happening. I wonder if screening one end of the pond off with wire too small for the fish would work? It might give the taddies somewhere to hide. bubba louie wrote: I wonder if screening one end of the pond off with wire too small for the fish would work? It might give the taddies somewhere to hide. I was thinking along those lines too. If you can put something around the eggs now, then hopefully some will survive to turn into frogs. Remember though that in the wild only a small number will survive to maturity. guzzigirl wrote: Remember though that in the wild only a small number will survive to maturity. Yep! I spotted an eastern brown (snake) in our dam yesterday, catching itself a good feed of frogs! I had to move my goldfish out of the pond down the back as he was getting fatter and fatter (he is now known by my grandson as the FAT FREAKY FISH) and for a while I couldn't work out why - - till I realized no tadpoles - so he is up with the other THINNER goldfish and I am hoping the frogs will come back. "The risk it takes to remain tight inside the bud is more painful than the risk it takes to blossom"
That would be a Banjo Frog if your are outside Victoria or a Pobblebonk if you are in Victoria. They get different names because the Victorian and non-Victorian populations are different sub-species, or something like that. The really rare species, which I am not certain occur outside Victoria, is the Growling Grass Frog. Rare because their grassland habitat does not get the same level of recognition and protection as our rain forests and hence there is little of it left that is undisturbed. These are much greener looking and sound a little like a Harley Davidson turning over. 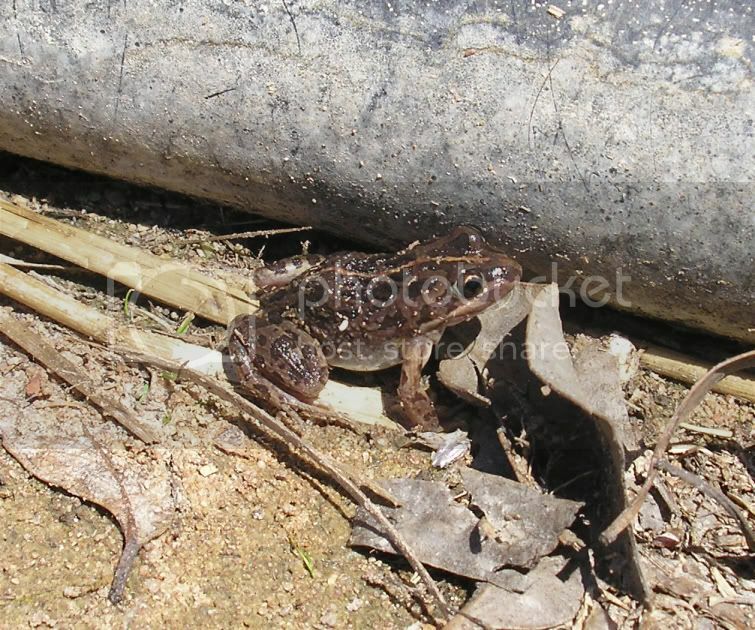 I recently came across a group of about 10 frogs in a damn at my mums place on the ACT/NSW border near Lake George. Does anyone know what sort of frogs they might be ? (see pics below). They were about an inch long or a bit over. I hate to tell you this Owen, but the first one is a cane toad. Not sure if you're joking or not Pam... but cane-toads are not found anywhere remotely near this location, and at 1 inch or so these frogs are way too small to be cane-toads, and the frog in pic 1 is the SAME frog as in pic 2, after it jumped into the shallows. I've done a bit of searching in the last hour or two and my money is now on 'lymnodynastes tasmaniensis", or the spotted marsh frog. oproudfoot wrote: my money is now on 'lymnodynastes tasmaniensis", or the spotted marsh frog. Frog calls are largely diagnostic of the species so take note of what their calls sound like. 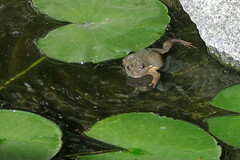 The frog websites often include recording of each species' call. How gorgeous - you must be providing them with a very healthy environment! !